Mgr inż. 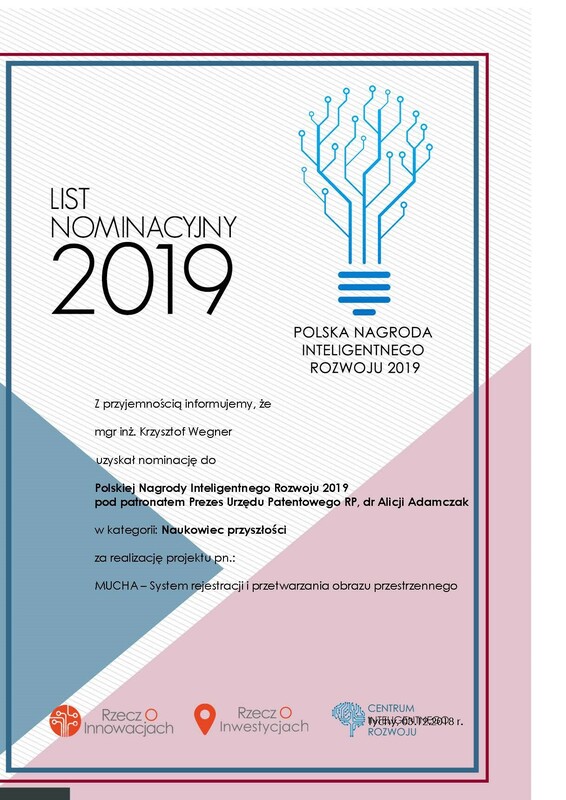 Krzysztof Wegner received a nomination for the prestigious Polish distinction Intelligent Development Awards 2019 under the patronage of the President of the Patent Office of the Republic of Poland Alicji Adamczak, Ph.D.
Miło nam poinformować o otrzymaniu przez Pana mgr. inż. Krzysztofa Wegnera nominacji do prestiżowego wyróżnienia Polskiej Nagrody Inteligentnego Rozwoju 2019 pod patronatem Prezes Urzędu Patentowego RP dr Alicji Adamczak w kategorii: „Naukowiec przyszłości". Nominacja została przyznana za projekt „MUCHA – System rejestracji i przetwarzania obrazu przestrzennego” finansowany przez Narodowe Centrum Badan i Rozwoju w ramach programu LIDER VIII. Projekt „MUCHA – System rejestracji i przetwarzania obrazu przestrzennego” dotyczy akwizycji i przetwarzania przestrzennej reprezentacji sceny ruchomej. Jest kontynuacją i rozwinięciem prowadzonych przez kierownika projektu wieloletnich prac badawczo-rozwojowych nad rejestracją, przetwarzaniem i wyświetlaniem obrazu trójwymiarowego oraz jego rozszerzeniem - obrazem przestrzennym. Celem projektu jest opracowanie innowacyjnego systemu rejestracji i przetwarzania obrazów przestrzennych o bardzo wysokiej rozdzielczości, dużej liczbie rejestrowanych promieni i szerokim kącie akwizycji. 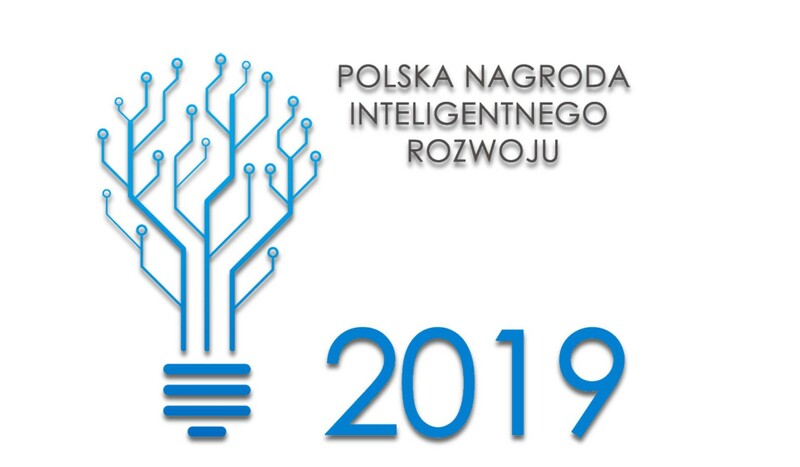 Wynikiem projektu będzie technologia konstrukcji nowej generacji kamer obrazu przestrzennego. W ramach prac wykonane zostaną prototypy kamer obrazu przestrzennego, umożliwiające pełną rejestracje przestrzenną obserwowalnego świata (prawie hologramu). Ponadto, wraz z systemem akwizycji (rejestracji obrazu przestrzennego) opracowane zostaną specjalistyczne algorytmy przetwarzające zarejestrowaną przestrzenną scenę ruchomą. Opracowane algorytmy, zaimplementowane w dedykowanym oprogramowaniu, umożliwią miedzy innymi wyświetlanie obrazów przestrzennych na nowej generacji monitorach obrazu przestrzennego (holograficznych, autostreoskopowych), nad którymi kończone są obecnie prace wdrożeniowe w wielu miejscach na świecie. Opracowane algorytmy umożliwią także wirtualne spacery w uprzednio zarejestrowanych ruchomych scenach przestrzennych, precyzyjne pomiary geometryczne zarejestrowanych obiektów lub fragmentów sceny, a także rearanżacje materiału wizyjnego w dużo szerszym zakresie niż jest to możliwe obecnie. Komisja konkursowa programu LIDER wysoko oceniła kwalifikacje naukowe zespołu oraz jego wniosek o finansowanie badań nad nowoczesnym systemem rejestracji i przetwarzania obrazu przestrzennego. Projekt zakłada opracowanie nowoczesnej modułowej kamery pola światła, która może być wprowadzona na rynek. Symboliczne czeki oraz pamiątkowe dyplomy wręczył laureatom konkursu dyrektor Narodowego Centrum Badań i Rozwoju, prof. dr hab. inż. Maciej Chorowski, podczas uroczystej gali, która odbyła się dnia 6. grudnia 2017 w Warszawie. Politechnikę Poznańską, poza laureatami, reprezentowała na gali pani Prorektor ds. nauki, prof. dr hab. inż. Jolanta Józefowska. 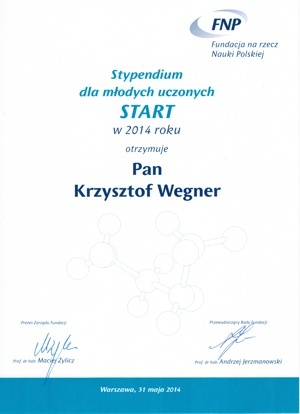 Mr Krzysztof Wegner, E.Sc., assistant in the Chair of Multimedia Telecommunications and Microelectronics for the second time received a grant for young scientists called “START”. 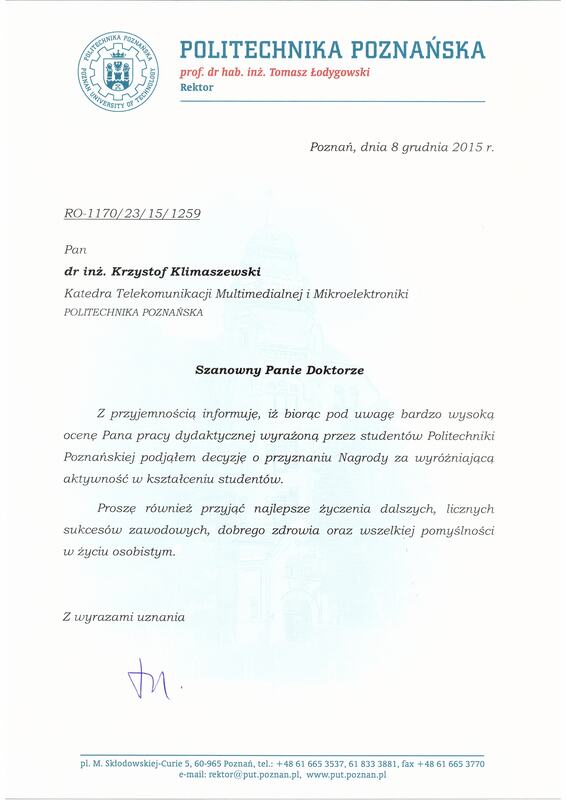 The grant was received from the Foundation for Polish Science. 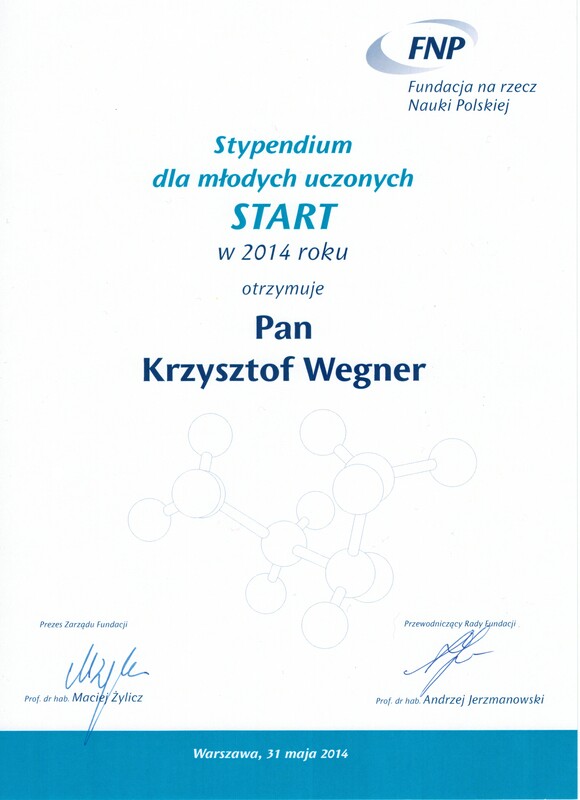 “START” program is the largest scholarship fund for the best young scientists in Poland. In 2015 edition of the competition, 130 scholarships were granted. The winners were carefully selected out of 1241 candidates who applied in this program. Krzysztof Klimaszewski, PhD received a reward for his outstanding teaching activities . The reward was granted by the Rector of PUT, based upon the opinions given by the students. 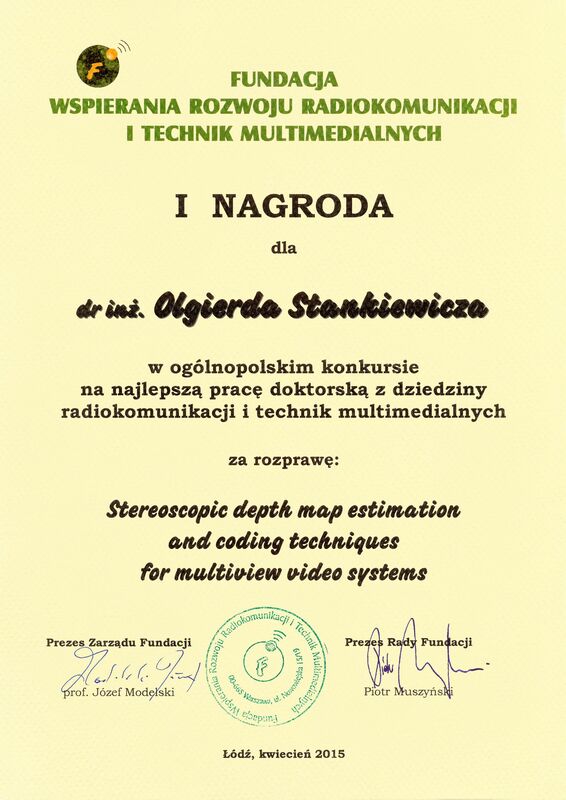 Ph.D. Olgierd Stankiewicz received the first award in the contest for the best Ph.D. dissertation related to radio communications and multimedia technologies organized by the Foundation for the Development of Radio communications and Multimedia Technologies for the dissertation Stereoscopic depth map estimation and coding techniques for multiview video systems (supervisor - prof. Marek Domanski). 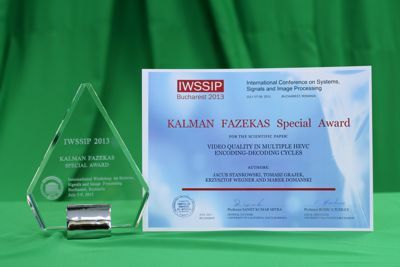 The contest included dissertations in the field of radio communications or multimedia techniques, defended with distinction between January 1, 2014 and January 9, 2015. The contest jury consisted of 5 professors of technical universities and the representatives of the foundation and media sponsors. 4 finalists were invited to present their works during the National Conference on Radiocommunications and Broadcasting 2015. We inform that the jury of the Medal for The Distinguished Graduate of Poznan University of Technology competition granted six distinctions among the graduates of all faculties of Poznan University of Technology of the year 2014. Half of the distinctions were granted to the graduates of the Chair of Multimedia Telecommunications and Microelectronics. Among the graduates who received the congratulation letters are: M.Sc. Dawid Mieloch, M.Sc. Adrian Dziembowski and M.Sc. Agnieszka Kuehn. All three theses were supervised by Professor Marek Domański. The Foundation for Polish Science distinguished M.Sc.Eng. 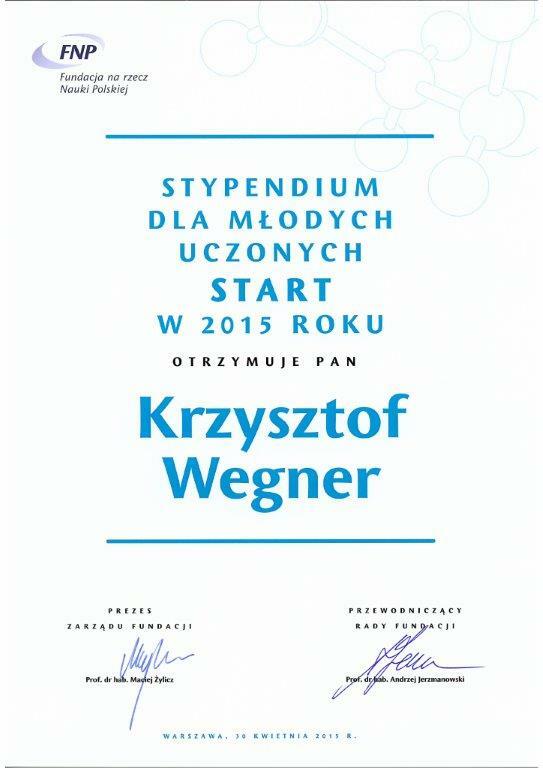 Krzysztof Wegner and awarded him a scholarship in the START programme. The aim of the programme is to distinguish the most talented young researchers and the scholarships serve as recognition of their scientific attainments and as an incentive for further growth by enabling them to devote themselves fully to their research. Candidates are evaluated on the basis of their scientific achievements and the research plans they submit. This year’s scholarship-recipients were chosen from 1250 candidates, the Foundation selected 136 beneficiaries – outstanding young scholars at the beginning of their scientific carreer, who already achieved some success in their field of study. The team of Chair of Multimedia Telecommunications and Electronics is one of the finalists of “Polish Invention 2014” – competition organized by Polish Television TVP1 together with Ministry of Education for inventors from entire country. The second edition gathered over hundred teams and only seven of them got into the finals. The team representing our University (Ph.D. Sławomir Maćkowiak, M.Sc. Eng. Łukasz Januszkiewicz, M.Sc. Eng. 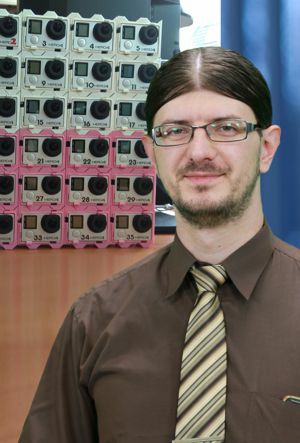 Krzysztof Kowalak, M.Sc. Eng. Paweł Gardziński, M.Sc. Eng. Łukasz Kamiński presented innovative system for automatic detection and classification of human behavior. In the Polish nationwide contest for the Best Ph.D. Dissertation of the years 2012-2013 related to the theory and the applications of the information systems for processing, analysis and interpretation of images and scenes, object recognition, modeling, generation and visualization of objects and scenes, perception and visual communication, the distinction was granted to Ph.D. Krzysztof Klimaszewski for the thesis “Compression algorithms of multi-view sequences” (supervisor: Prof. Marek Domański). Only one award and one distinction have been granted in this contest. The contest is organized by the Association for Image Processing. The Foundation for Supporting the Development of Radiocommunication and Multimedia Technologies awarded to Eng. Jarosław Samelak 3rd prize in the competition for the best paper prepared and presented by a young author. 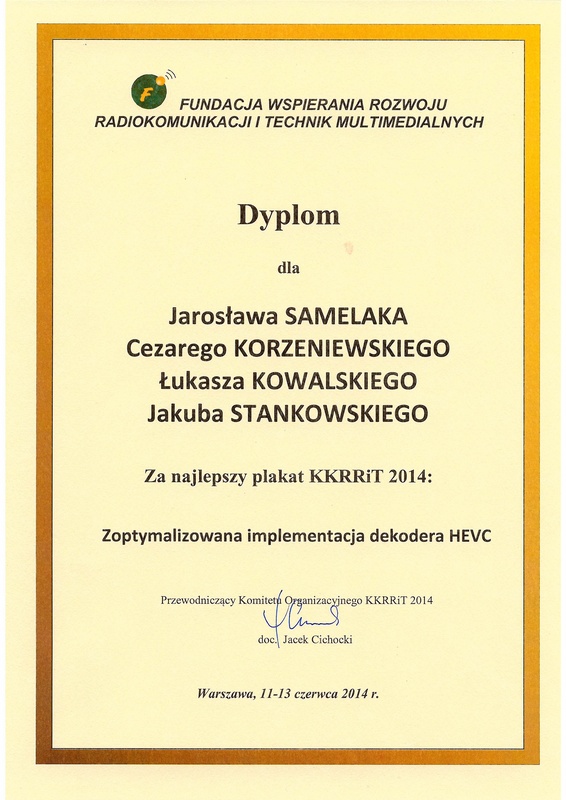 The prize was granted to the paper “Optimized implementation of HEVC decoder” (Zoptymalizowana implementacja dekodera HEVC) presented during National Conference on Radiocommunications and Broadcasting 2014. 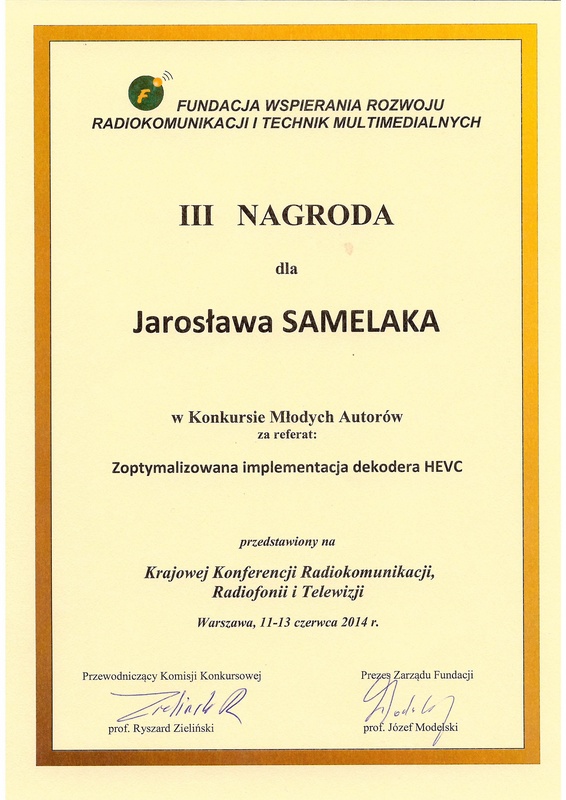 The Foundation for Supporting the Development of Radiocommunication and Multimedia Technologies distinguished the poster “Optimized implementation of HEVC decoder” (Zoptymalizowana implementacja dekodera HEVC) as the best poster presented at National Conference on Radiocommunications and Broadcasting 2014. The poster prepared by Jarosław Samelak, Cezary Korzeniewski, Łukasz Kowalski and Jakub Stankowski was chosen from over 30 posters presented during the conference. 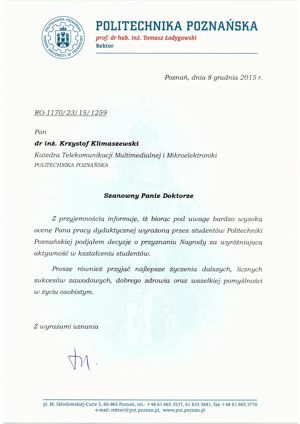 In the contest organized by the Foundation for Supporting the Development of Radiocommunication and Multimedia Technologies for the Best PhD dissertation related to radiocommunication and multimedia technologies Ph.D. Jacek Konieczny received the first award for the dissertation “Motion Information Coding for 3D Video Compression” (supervisor: Prof. Marek Domański). In this year’s edition of the contest Ph.D. dissertations defended between 1st January 2013 and 21st February 2014 were submitted. The contest jury consisted of 5 professors of technical universities and the representatives of the foundation and media sponsors. 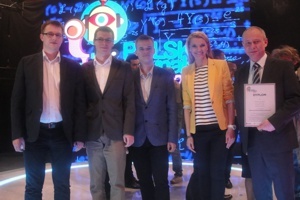 6 finalists were invited to present their works during the National Conference on Radiocommunications and Broadcasting 2014 in Warsaw. 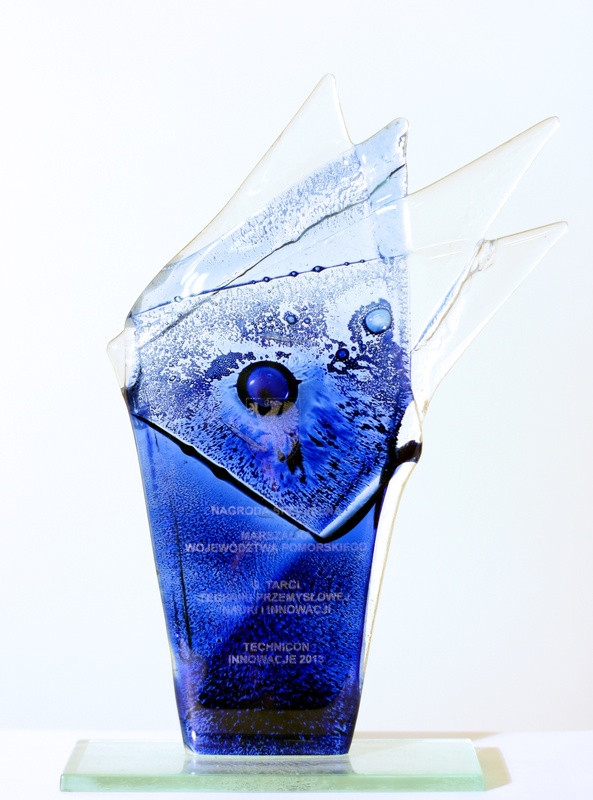 Special prize of Marshal of Pomorskie voivodeship awarded during 9. Industrial Technology, Science and Innovation Fair TECHNICON-INNOWACJE 2013 for a system for automatic detection and classification of human behaviour developed by the team of Chair of Multimedia Telecommunications and Electronics: dr inż. Sławomir Maćkowiak, mgr inż. Łukasz Januszkiewicz, mgr inż. Krzysztof Kowalak, mgr inż. Paweł Gardziński, mgr inż. Łukasz Kamiński. 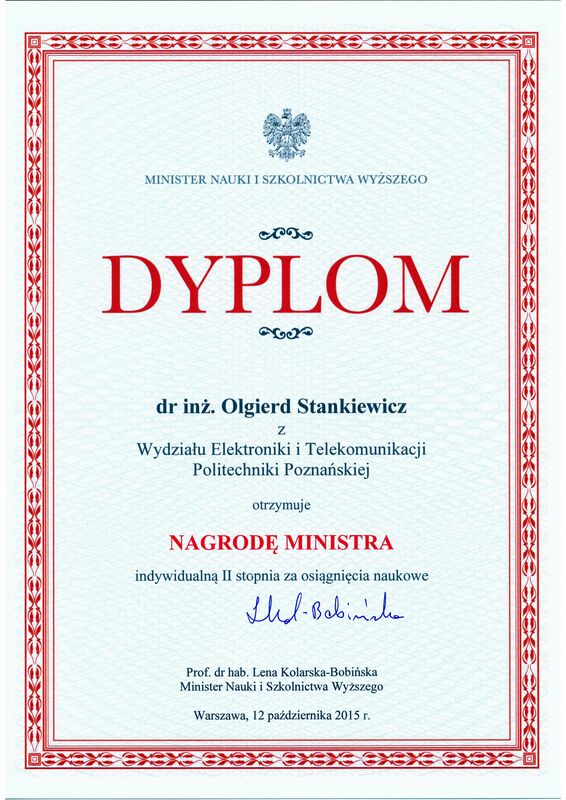 Gold medal in INNOWACJE 2013 contest during 9. Industrial Technology, Science and Innovation Fair TECHNICON-INNOWACJE 2013 for „Stereoskopowy system automatycznego pomiaru gabarytów pojazdów” (Stereoscopic system for automatic measurements of vehicle dimensions) developed by the team of Chair of Multimedia Telecommunications and Electronics: prof. dr hab. inż. Marek Domański, dr inż. Tomasz Grajek, mgr inż. Robert Ratajczak, dr inż. Krzysztof Klimaszewski, mgr inż. Maciej Kurc, mgr inż. 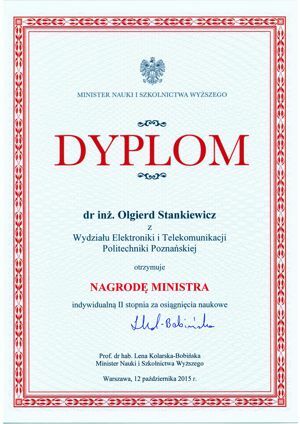 Jakub Stankowski, dr inż. Marta Stępniewska, mgr inż. 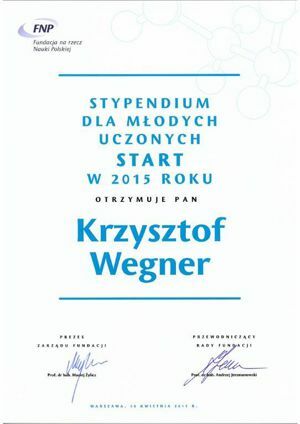 Krzysztof Wegner, inż. Adrian Dziembowski, inż. Dawid Mieloch, inż. 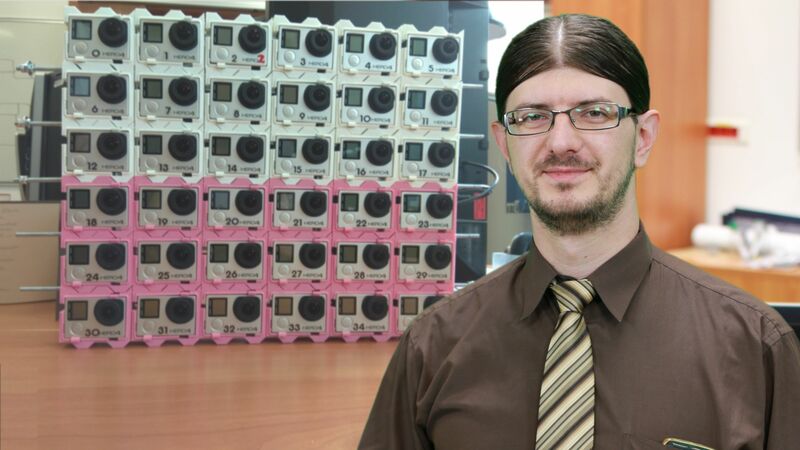 Tytus Sielach and in cooperation with Zylia sp. z o.o., Poznań. In the Polish nationwide contest for the Best Ph.D. Dissertation defended at Polish scientific institutions (2010-2011), in the scope of widely understood communication between the computer and its ambience by means of images, and the application of information systems for processing, analysis and interpretation of images and scenes, object recognition, modelling, generation and visualisation of objects and scenes, perception and visual communication, the award was granted to Ph.D. Tomasz Grajek for the thesis “Modeling of advanced video encoders” (supervisor: Prof. Marek Domański). 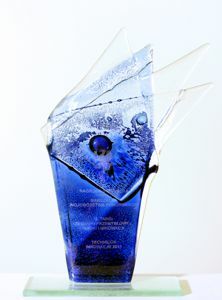 Only one award has been granted in this contest. 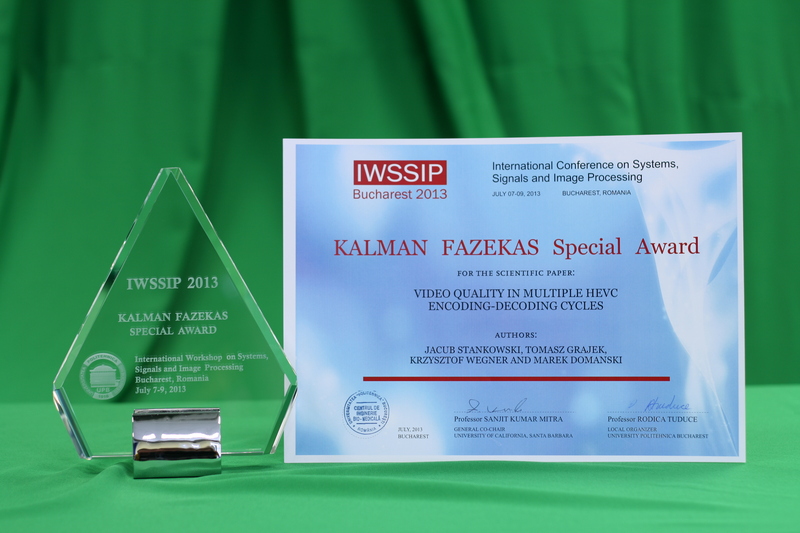 The contest is organized by the Association for Image Processing.